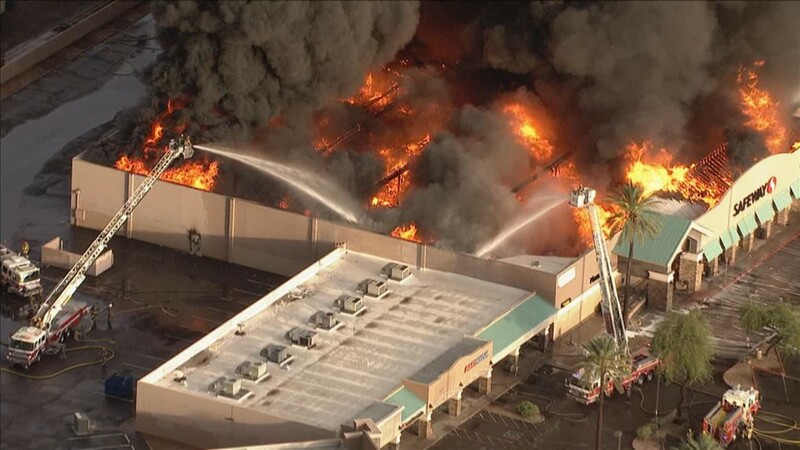 A Phoenix fire spokesperson said over 75 firefighters battled the flames that ultimately destroyed the Phoenix grocery store. 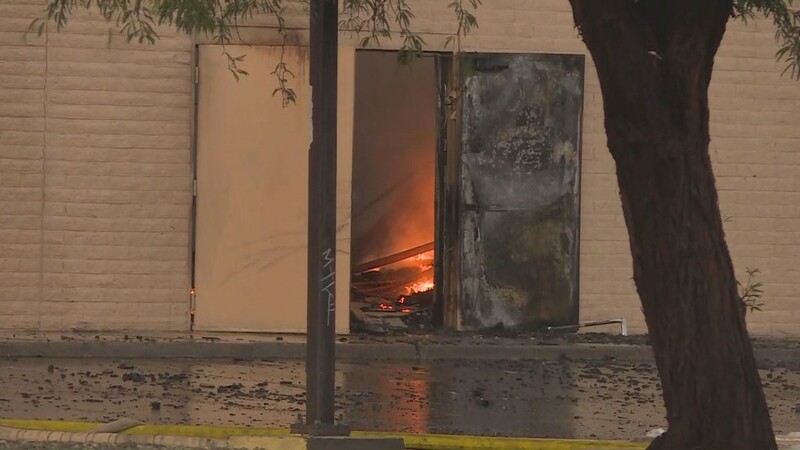 PHOENIX — An investigation from the Phoenix Fire Department concludes that a strong storm was a factor in sparking a massive fire at a Safeway last Wednesday. 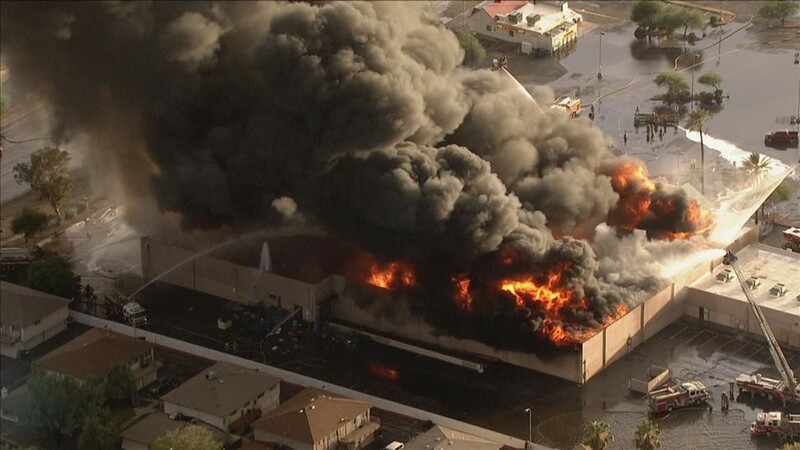 By Thursday morning, the fire had destroyed the Phoenix grocery store. 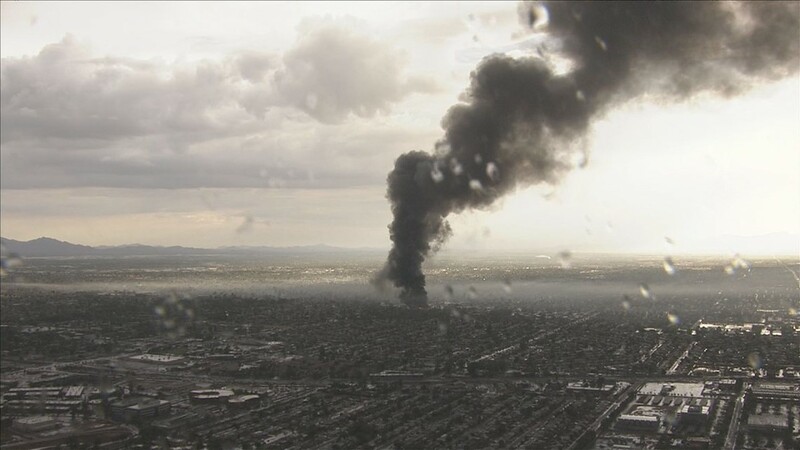 According to Phoenix fire spokesman Capt. 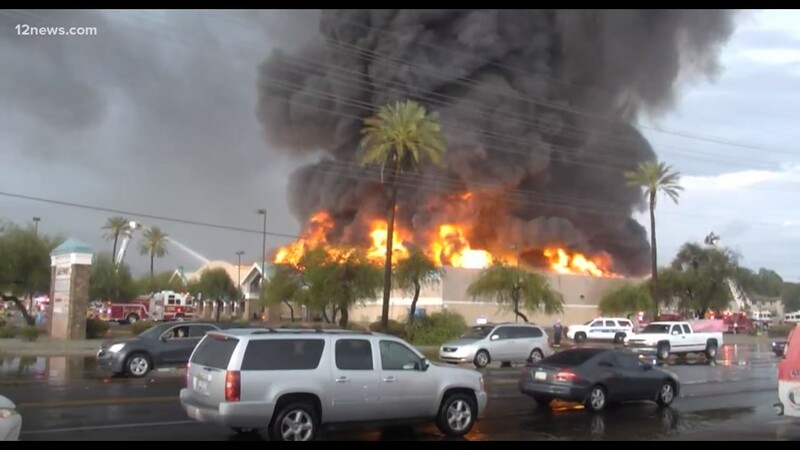 Rob McDade, a microburst dumped a large amount of rain in the area prior to the fire. 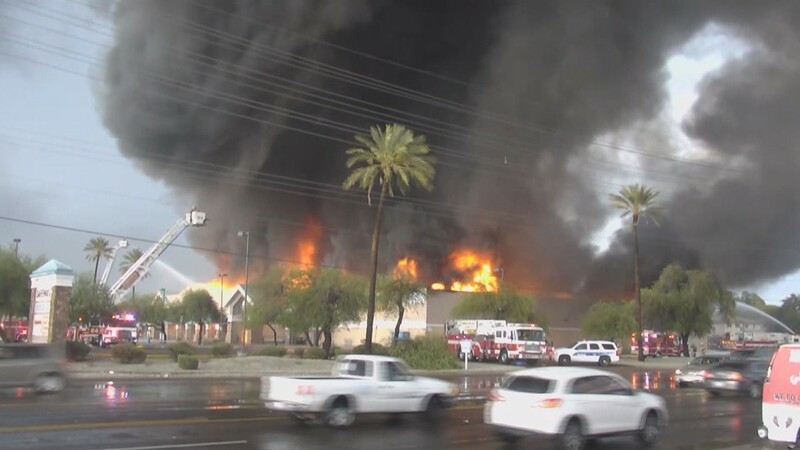 McDade said fire investigators believe the grocery store's flat roof may have collected the water from the microburst and from previous rain this week. 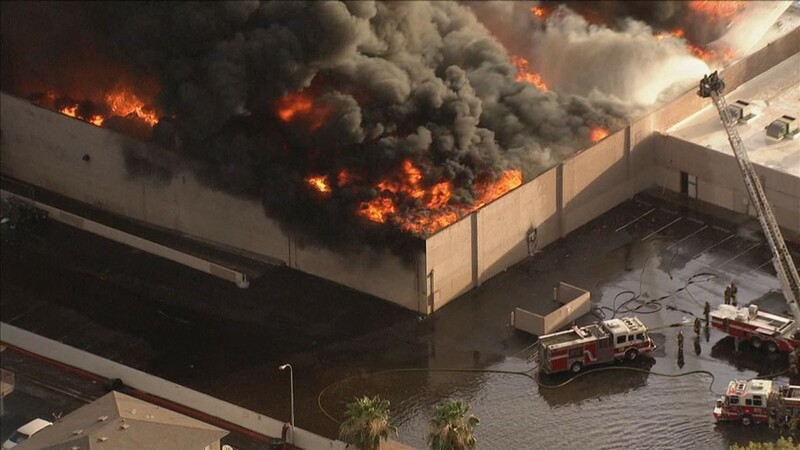 Phoenix fire spokesman Capt. 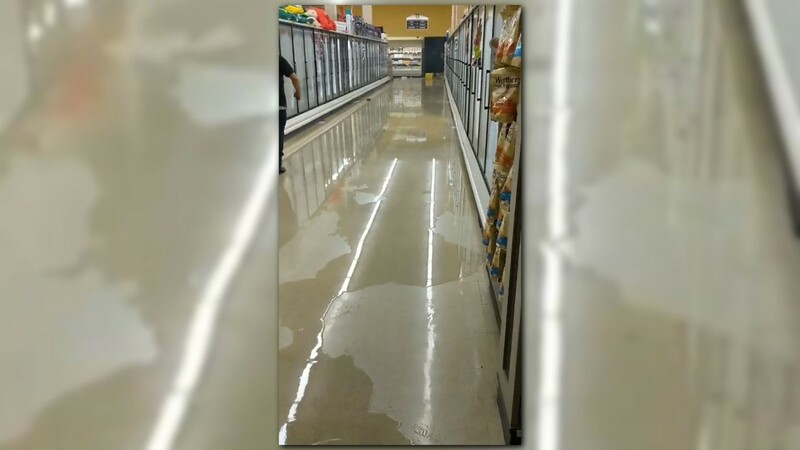 Larry Subervi said there was a "bunch of debris" left on the store's roof by the previous day's storm, which clogged up the gutters designed to drain water off the roof. 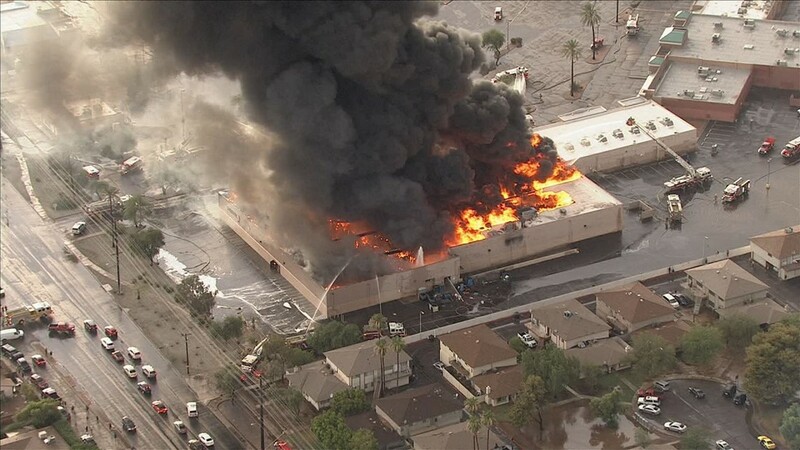 The heavy weight of that much water caused a partial roof collapse in the back of the store, which broke a gas line and damaged the main electrical box, Phoenix fire said. 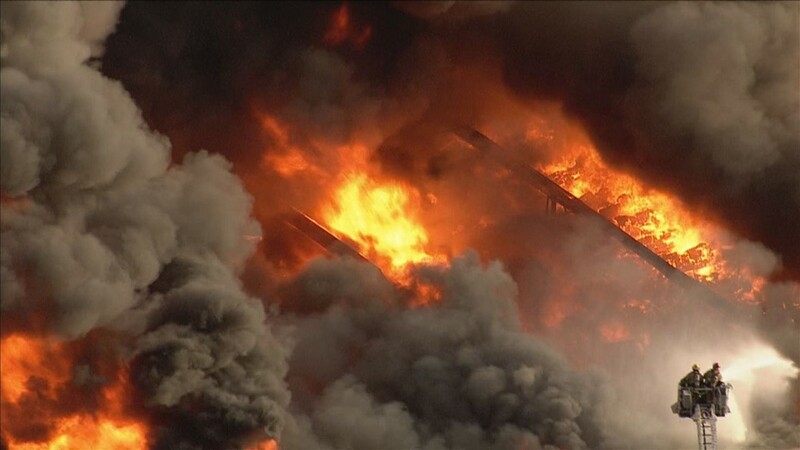 The combination of events "might have," McDade said, started the massive fire. 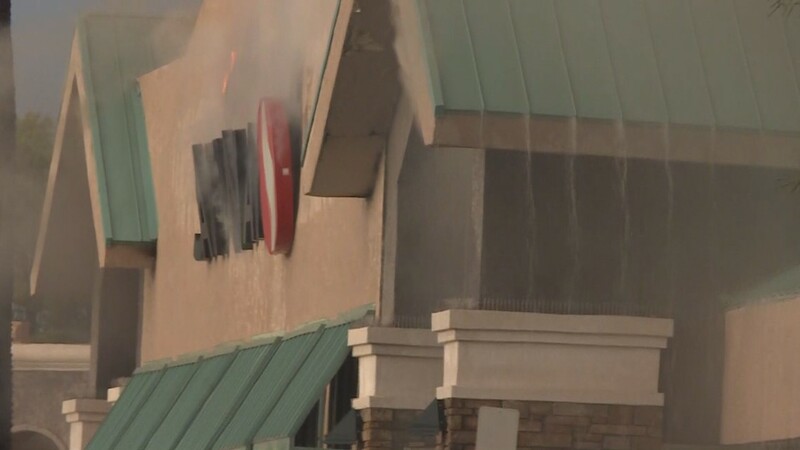 "It's a bunch of crazy things that lined up to cause the fine," Subervi said. 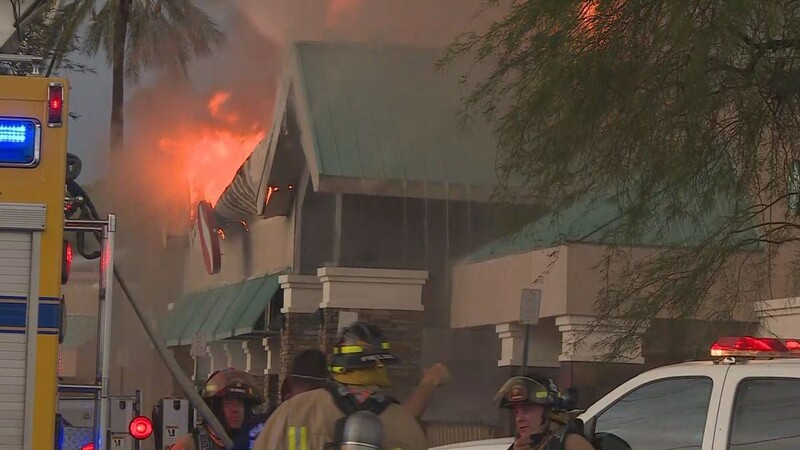 The fire department's investigation concluded the roof collapse resulted in significant damage to the building’s electrical system and natural gas system. 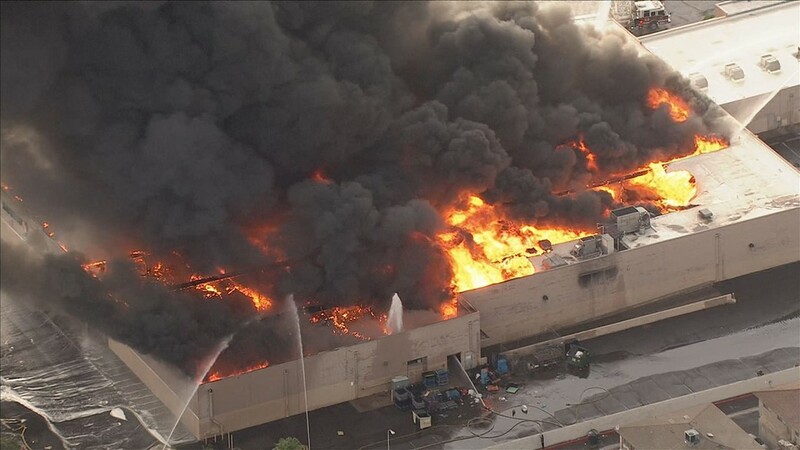 The fire has been classified as "undetermined," fire officials said. 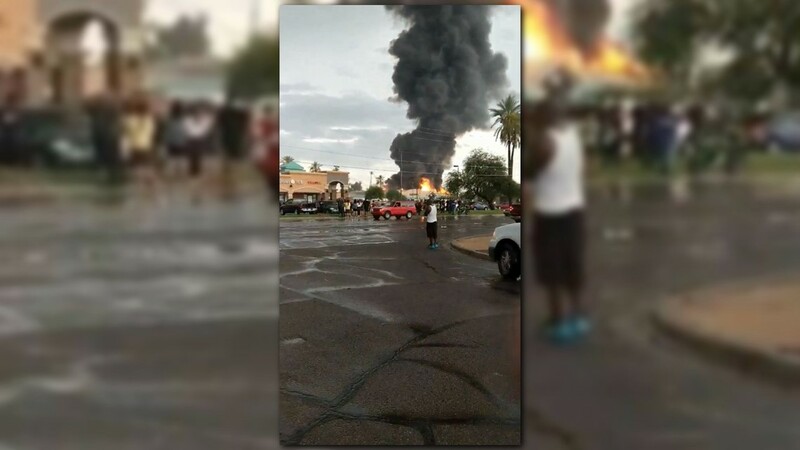 McDade said over 75 firefighters battled the flames. 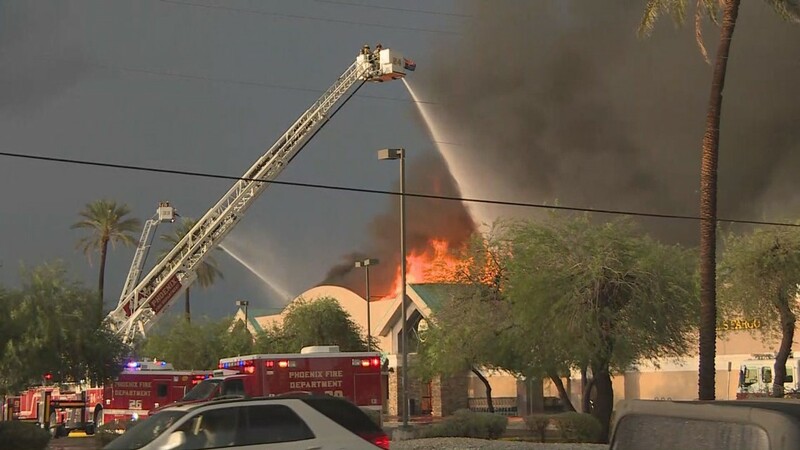 Firefighters were dispatched to the grocery store near Northern and 35th Avenues just before 6 p.m. 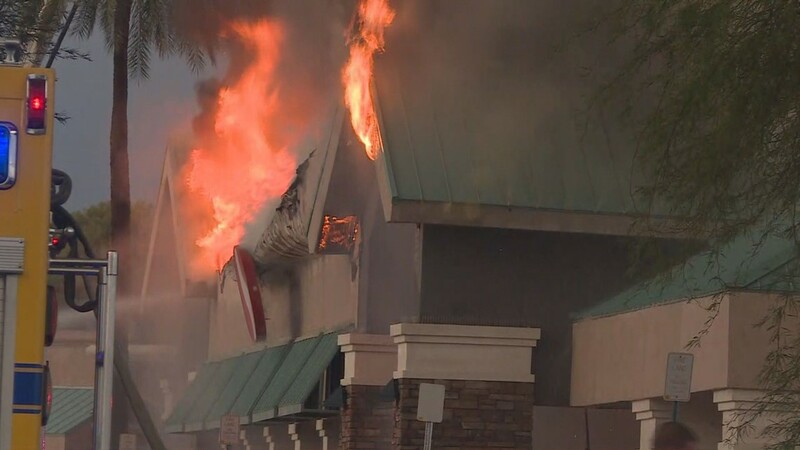 When a 12 News photographer arrived at the scene, it was clearly more than just a roof collapse. The streets in the area were flooded, showing just how hard the storm hit the neighborhood. 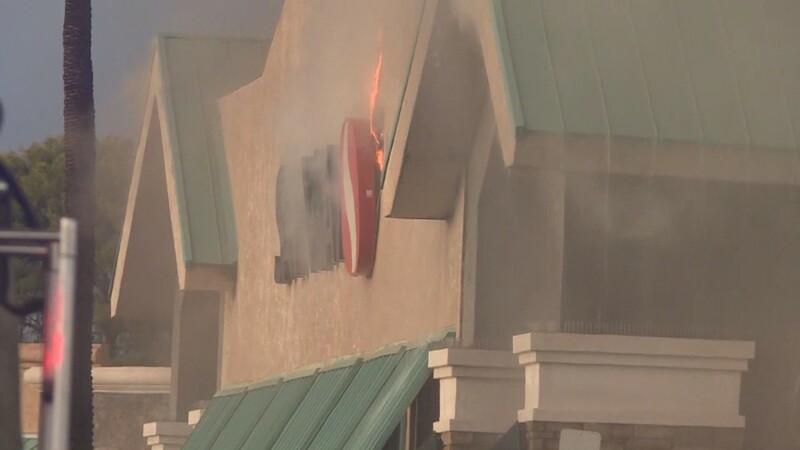 People inside the Safeway said the store shook before flames appeared. 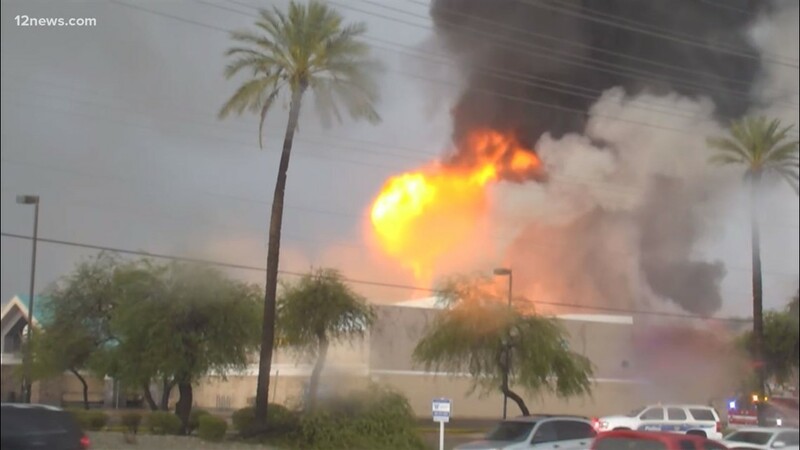 Phoenix fire said everyone got out of the store, and there were no injuries. 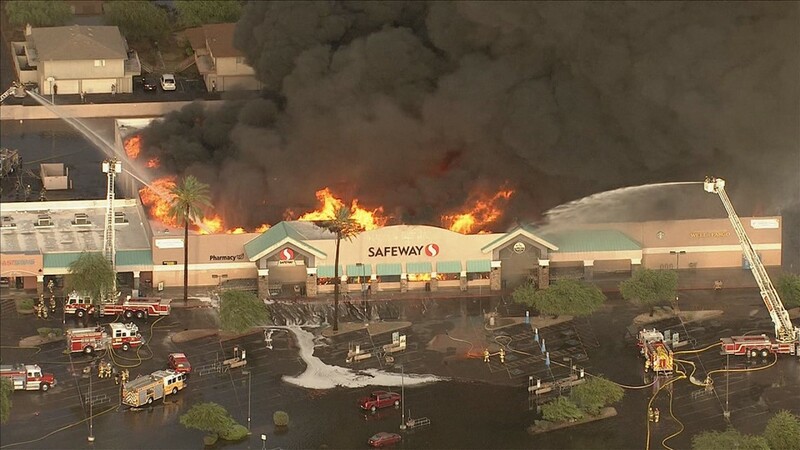 "Based on the work of the Safeway employees and citizens listening when they said exit, everyone got out safely," Subervi said. 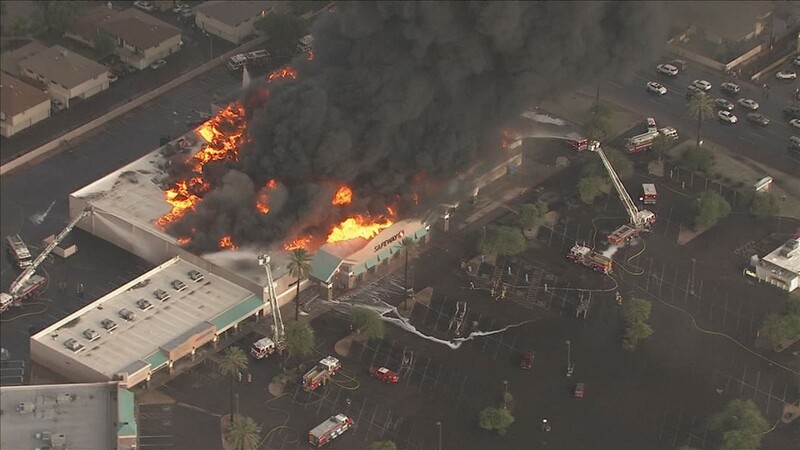 Nearby residents were advised to stay inside their homes while the store is burning and smoke fills the Phoenix sky. 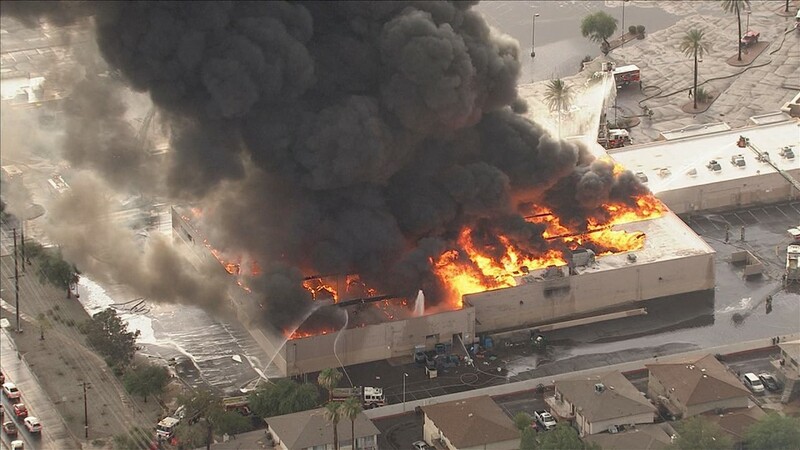 Phoenix Fire Department spokesperson Rob McDade said that everyone inside the building got out of the store and nobody has been reported injured. 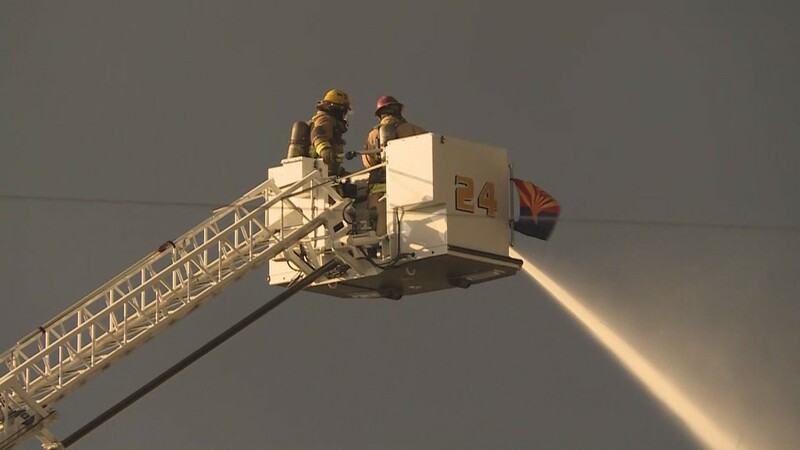 Fire officials said that firefighters responded to a roof collapse at the grocery store near Northern and 35th Avenues. They were dispatched at 5:53 p.m. 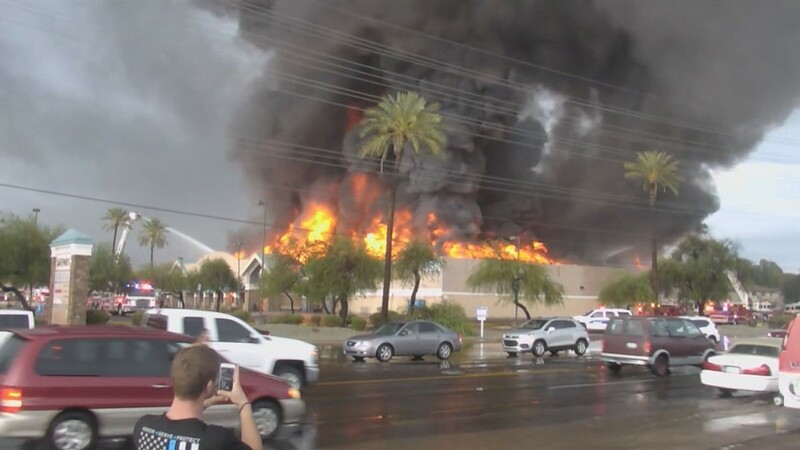 When a 12 News photographer arrived at the scene, it was clearly more than just a roof collapse. The streets in the area are flooded, showing just how hard the storm hit the neighborhood. 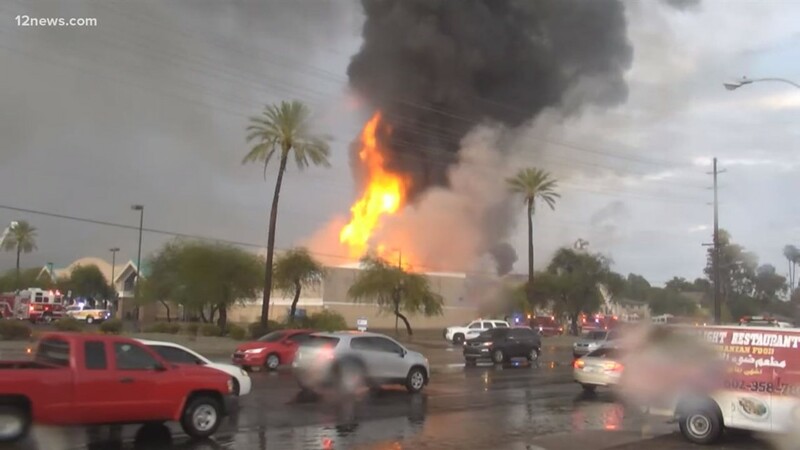 It's not clear if the fire was caused by lightning. 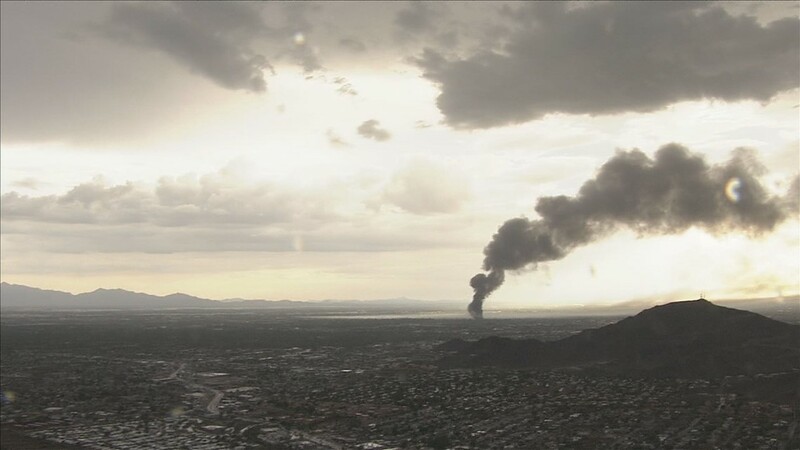 No other nearby buildings appear to be in danger at time, but the smoke is visible from 12 News' downtown Phoenix studio. 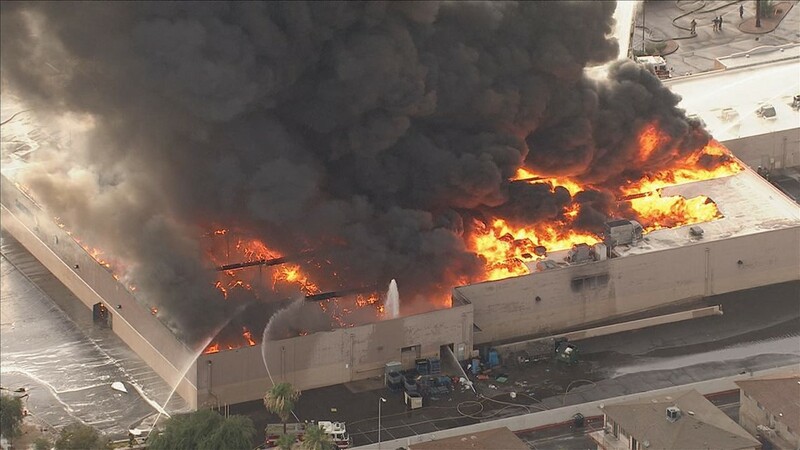 A fire department spokesperson advised people to stay inside their homes while the store is burning and smoke fills the Phoenix sky. 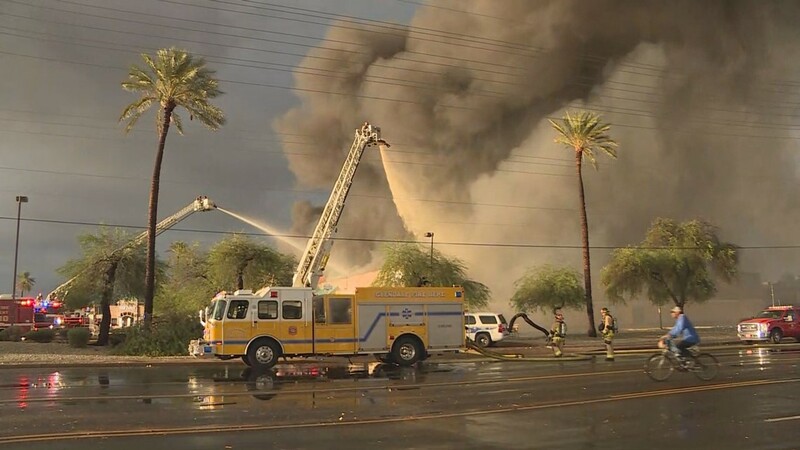 Wednesday is the third consecutive day of damaging storms in the Phoenix area. 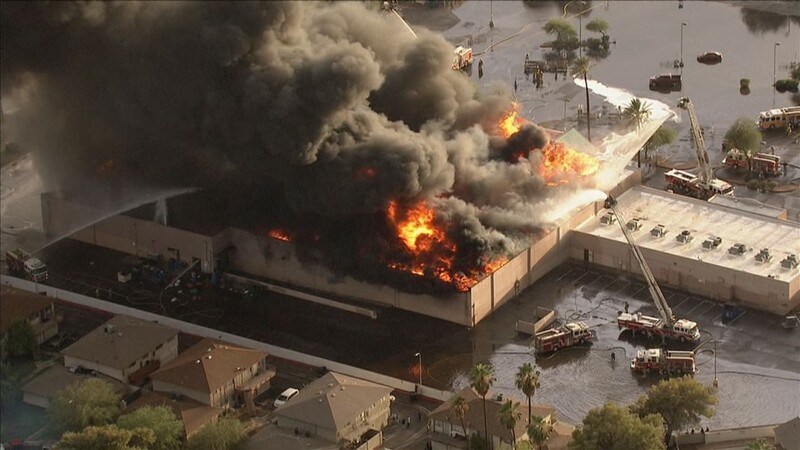 The fire garnered a third-alarm response from the Phoenix Fire Department. 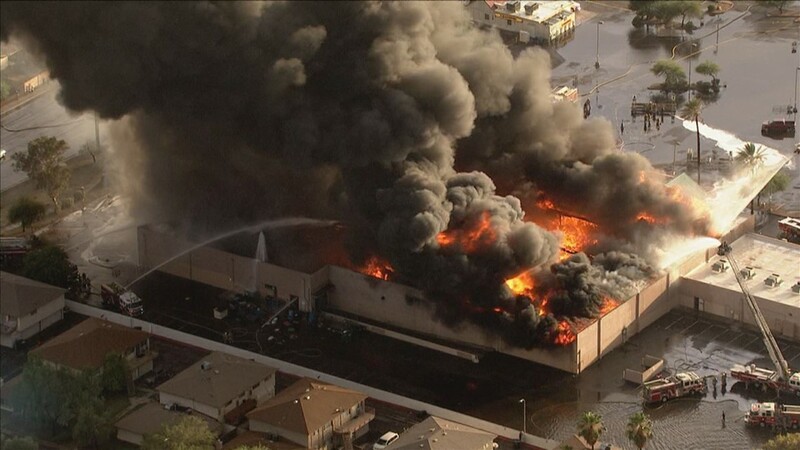 Subveri said at one point, as conditions changed quickly, firefighters fighting the fire inside the store had to "literally" leave their equipment inside and run out to battle the flames defensively. 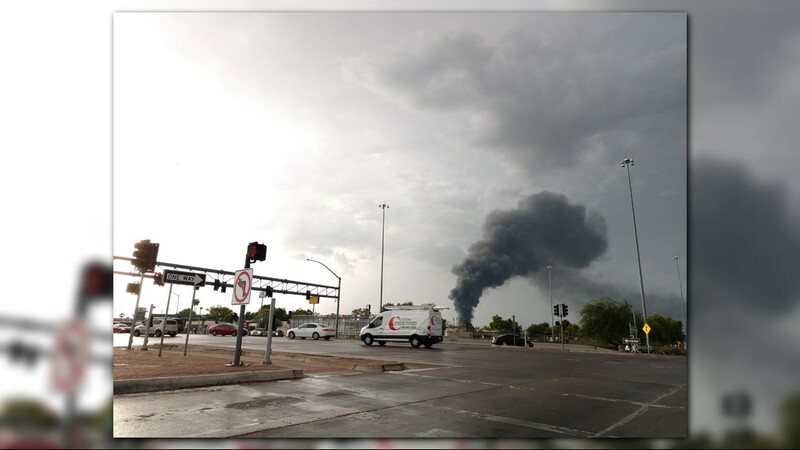 Wednesday was the third consecutive day of damaging storms in the Phoenix area. 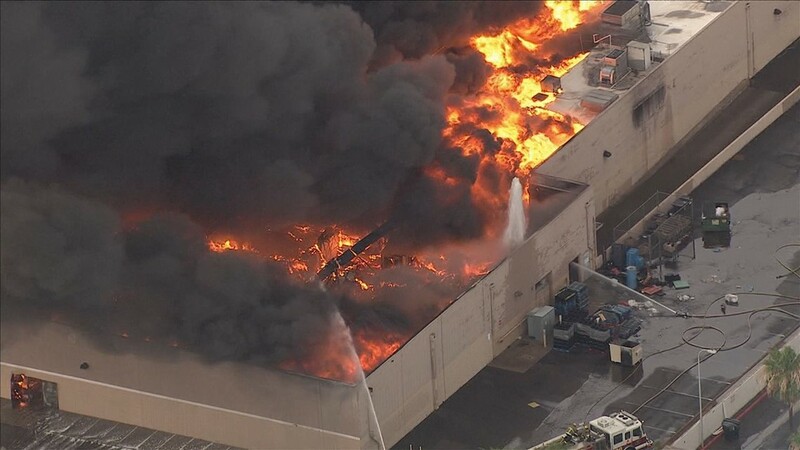 Subveri said the department is sending a fire watch every hour, and will continue to do so for the next 24 hours at least, to make sure there aren't any areas that will reignite. "If you think of something on a small scale like a campfire, even after you put it out, if you put your hand in the middle of those logs it's going to be very hot," Subveri said. "This is a couple thousand square feet of that." 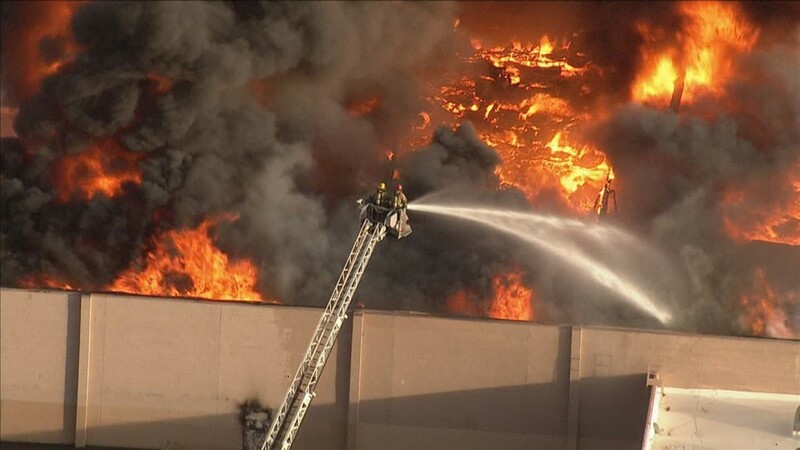 He said the humidity in the air could lead to some of that trapped heat not being able to dry out as fast. 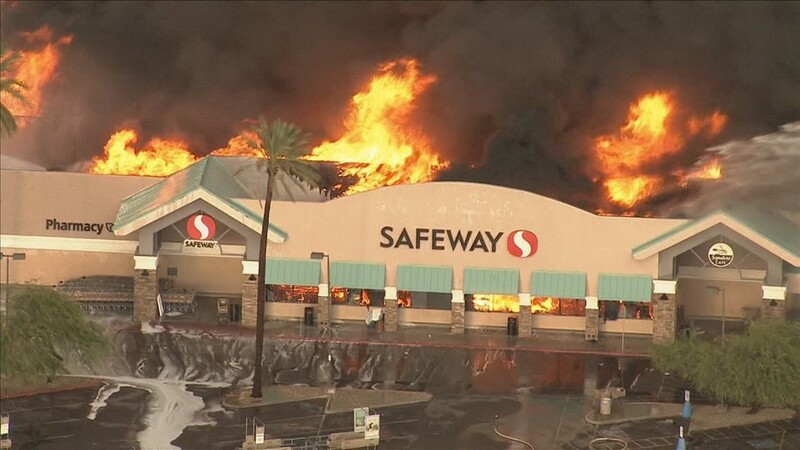 The Safeway was a loss, but Subveri said firefighters were able to save "everything" to the north of the building. 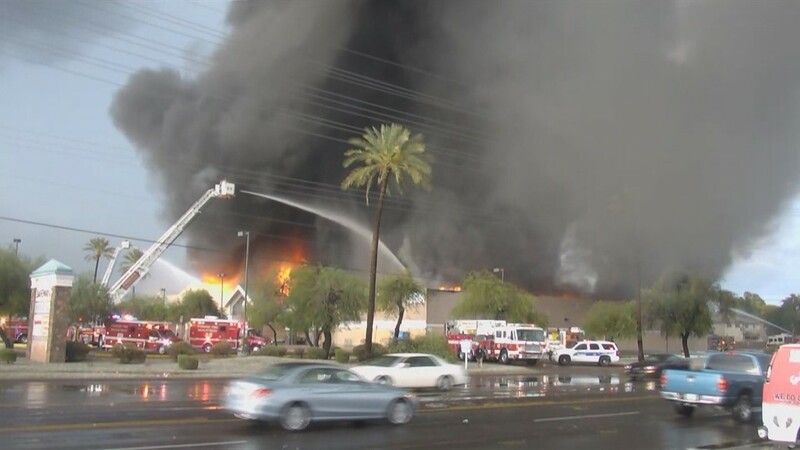 "On behalf of Safeway and Albertsons management and employees, we wish to thank all first responders including Phoenix Fire, Phoenix Police, Glendale Fire, and utility crews, who worked fearlessly throughout last night and into early morning hours battling the fire that devastated Safeway located at 35th Ave and Northern in Phoenix. 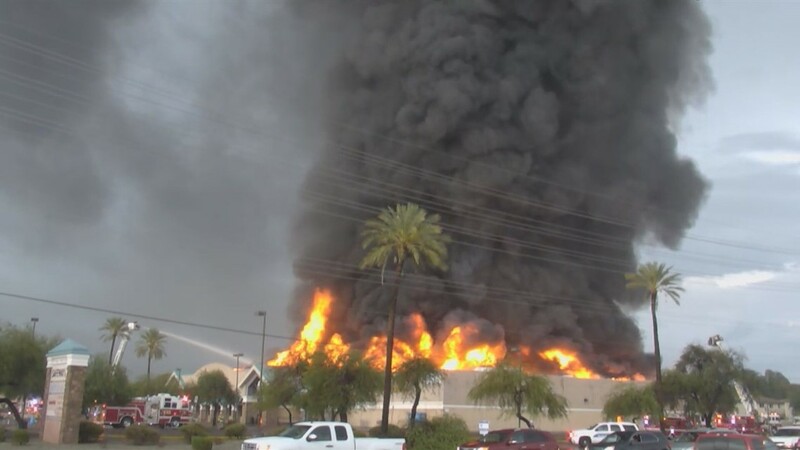 Our primary concern throughout this tragic fire was for the safety of our employees, customers and emergency workers. 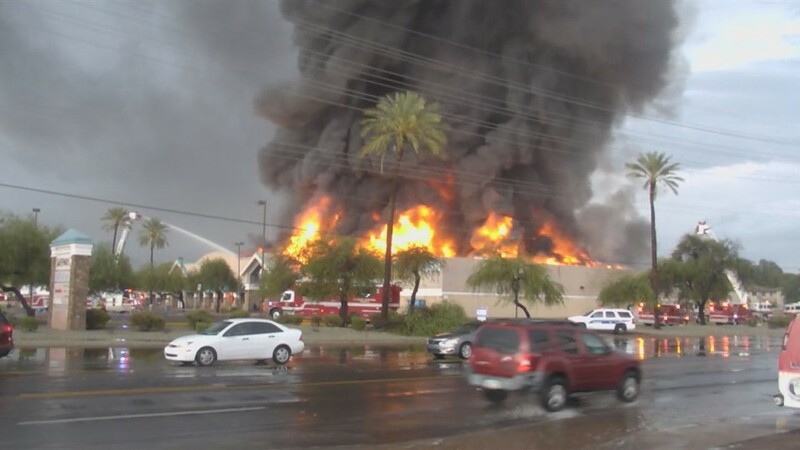 This morning we are grateful, beyond measure, that there are no reported injuries or casualties. 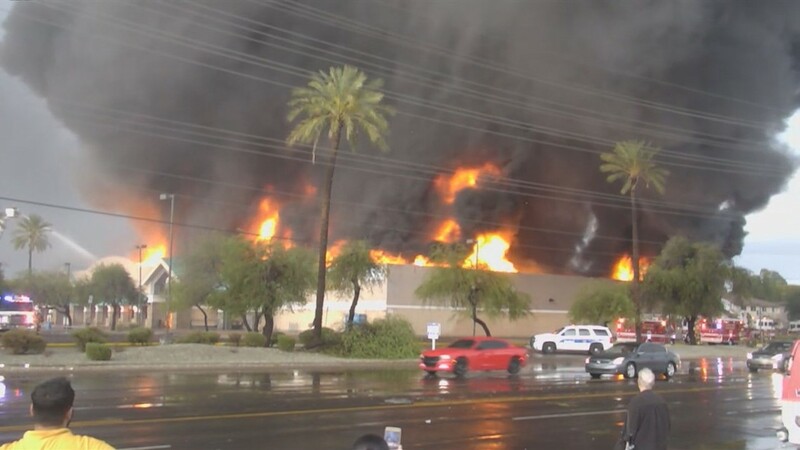 It is our intent to relocate employees from this store to other locations in the Phoenix and surrounding areas. 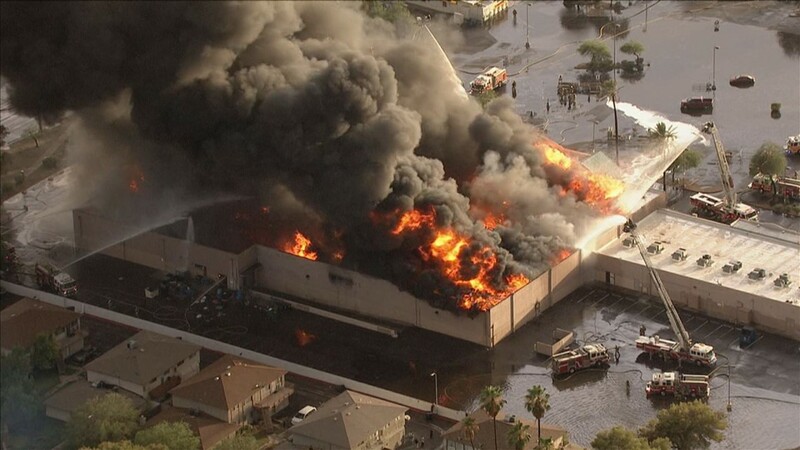 Though we never anticipated this tragedy, our company leaders are focused on determining next steps following the loss of this store. Our heartfelt gratitude extends to the community in which we’ve had the privilege of serving for 37 years at this location. 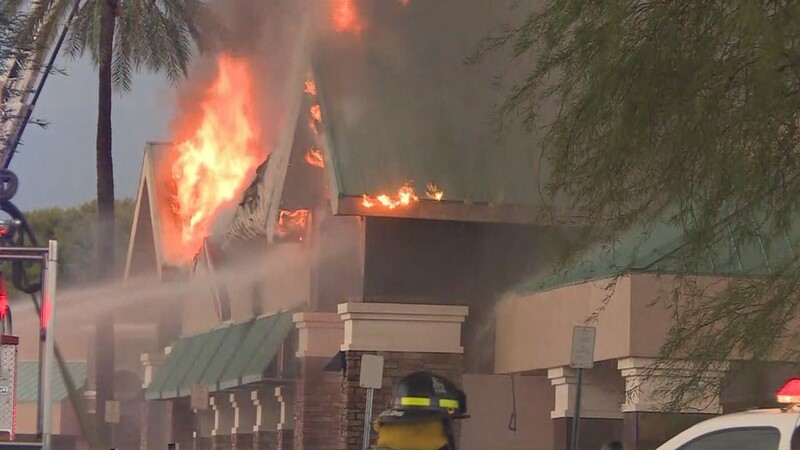 We realize that this Safeway location was the main grocery store for many residents in the area and we’re exploring different options to assist residents with their shopping needs." 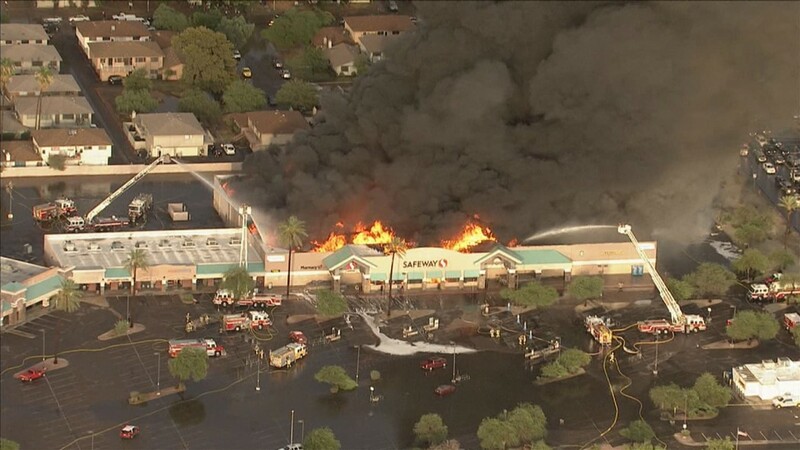 The company said pharmacy customers can fill prescriptions at any nearby Safeway or Albertsons location.